Both Standard Costing and Budgetary Control are based on the principle that costs can be controlled along certain lines of supervision and responsibility, that focuses on controlling cost by comparing actual performance with the predefined parameter. However, the two systems are neither similar nor interdependent. Standard Costing delineates the variances between actual cost and the standard cost, along with the reasons. On the contrary, Budgetary Control, as the name suggest, refers to the creation of budgets, then comparing the actual output with the budgeted one and taking corrective action immediately. The two systems aim at measuring performance by fixing targets. Nevertheless, The former, forecasts, cost accounts but the later projects detail about financial accounts. Similarly, there are many differences between Standard Costing and Budgetary Control, which has been discussed below. Meaning The costing method in which evaluation of performance and activity is done by making a comparison between actual and standard costs, is Standard Costing. Budgetary Control is the system in which budgets are prepared and continuous comparisons are made between the actual and budgeted figures to achieve the desired result. Basis Determined on the basis of data related to production. Budgets are prepared on the basis of management's plans. Range It is limited to cost details. It includes cost and financial data. Effect of temporary changes in conditions The short term changes will not influence the standard costs. The short term changes will be shown in the budgeted costs. Standard Costing is a cost accounting technique, which helps to measure the performance of material, labor & overhead and report the variances, to take corrective actions. The variances are being analyzed in detail and reported by comparing the actual costs with the standard cost for actual output along with determining the reasons for the same. There are two types of variances i.e. favorable (actual cost is less than the standard cost) and adverse (actual costs exceed standard costs). Standard Costing is a tool for ascertaining and controlling the costs. With this technique, the organization can make best possible use of the resources. In addition to this, the management can keep a check on the organizational activities by assessing the deviations, i.e. analyzing the difference between actual performance and the standard performance. The budgets are designed in accordance with the policy requirements. Constant comparisons are made between the actual output and the budgeted targets to review the performance. Revisions are made if in case the existing conditions are changed. Appropriate actions are taken if the expected results are not achieved. Here, budget refers to a written financial statement expressed in monetary terms prepared in advance for future periods, containing the details about the economic activities of the business organization. The Budgetary Control system facilitates the management to fix the responsibilities and coordinate the activities to achieve the desired results. It helps the management to measure the performance of the organization as a whole. Moreover, it helps in the formulation of future policies by reviewing current trends. Standard Costing is a cost accounting system, in which performance is measured by comparing the actual and standard costs. Budgetary Control is a control system in which actual and budgeted results are compared continuously in order to achieve the desired result. Standard Costing is limited to, cost data, but Budgetary Control is related to cost as well as economic data of the enterprise. standard costing is a unit concept, unlike budgetary control is a total concept. Standard Costing has a restricted scope, limited to production costs only, whereas Budgetary Control, has a comparatively wider scope as it covers all the operations of the whole organization. In Standard Costing variances are revealed and reported however in budgetary control, as the control are being exercised at the same time, the variances are not disclosed. In Standard Costing the comparison is made between actual cost and standard cost of actual output. On the other hand, in Budgetary Control the comparison is made between the actual and budgeted performance. Standard costs do not change due to short-term changes in the conditions, but budgeted costs may change. Standard Costing applies to manufacturing concerns. In contrast to Budgetary Control, which applies to all the organizations. 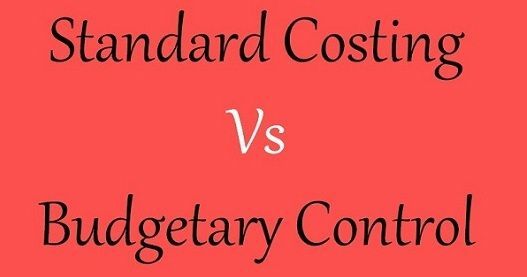 Both Standard Costing and Budgetary Control are the techniques which provide a yardstick to judge the performance and analyze disagreement of the actual and estimated figures. Budgetary Control makes side by side comparisons, and that is why periodic revisions are made in the budgets, and that is why there is no need for reporting the variances, which is absent in Standard costing.